Close’s character was dissuaded from seeking stardom by none other than McGovern, playing an embittered novelist who stops the show with her one big scene, claiming that women’s voices are ignored by publishers and the public alike (“A writer’s gotta be read, honey,” she sighs). Like “The Wife,” “The Chaperone” takes its title from a reductive role women have been branded with throughout the generations, limiting the growth of their identity so that it may be defined by their caregiver status. Carlisle has resigned herself to the routines of an empty home life, yet something awakens within her as she watches 15-year-old Brooks dance with carefree exuberance for an uptight audience of elders. When she learns that the girl plans to study with a revered dance company in New York City, Carlisle is eager to chaperone her, though for reasons that run deeper than a temporary escape from domestic entrapment. The friendship that evolves between the mismatched pair is certainly among the film’s primary focuses, but it often plays second fiddle to Carlisle’s solo journey of self-discovery, and ultimately self-actualization. Having been abandoned by her biological mother (Blythe Danner) soon after her birth, she is desperate to track the elusive parent down in the hopes that it will provide her with a sense of direction and catharsis. When she finally does meet the woman, while surrounded by the ageless statues in Central Park, Danner’s matriarch is revealed to be tragically aloof, unwilling to embrace Carlisle as her own flesh and blood, let alone introduce her daughter to the rest of her family. Her lack of knowledge regarding the functions of her body at an early age—she thought menstruation signaled impending death—deftly illustrates the pitfalls of innocence, as does Carlisle’s marriage to her much older husband (Campbell Scott) at age 16. Her terse response to his declaration of love, “That’s nice,” foreshadows a wrenching flashback where McGovern transforms her lines into a howl of pent-up fury after decades of consistently repressed needs. It is largely to the credit of McGovern’s superb performance that Carlisle emerges as a compelling subject, since she also happens to be almost entirely fictional, contrived by Moriarty as the Julie Powell to Brooks’ Julia Child. On the cusp of her character becoming one of the most sexually liberated stars of the silent era, Richardson radiates the allure and sophistication that made Brooks such a revolutionary figure onscreen. From her trend-setting bobbed hairstyle and non-theatrical emoting to her rejection of gender norms that led her to become an outsider in Hollywood, Brooks sorely deserves to be the subject of her own film, hopefully one headlined by Richardson. Just as she overcame the melodramatic excesses of Justin Baldoni’s recent teen drama, “Five Feet Apart,” with her vibrant humanity, the assured actress makes the most of her screen time, channeling Brooks’ fearlessness for subverting notions of societal impropriety. If Richardson’s Instagram page is any indication, where she repeatedly posts amusing snapshots of her face askew—accentuating her chin flab—in order to poke fun at the app’s photogenic falseness, it seems clear that she and Brooks may indeed be kindred spirits. Even when she’s asked to do the impossible during an epilogue that jumps ahead two decades, requiring her to portray a 35-year-old version of herself with age lines suggested solely through smudges on her face, Richardson somehow suspends our disbelief through the dramatic shift in her behavior. Devoid of the vigor that marked her adolescence, Brooks now resembles a hollow shell whose youthful fire has been stamped out, courtesy of endless battles with studio moguls and patriarchal oppression. Had she chosen not to shun Paramount for denying her a guaranteed raise, she likely wouldn’t have secured her immortality in Germany, where she pushed the boundaries for sexual frankness in 1929’s “Pandora’s Box,” a landmark work glimpsed all-too-fleetingly in the end titles. 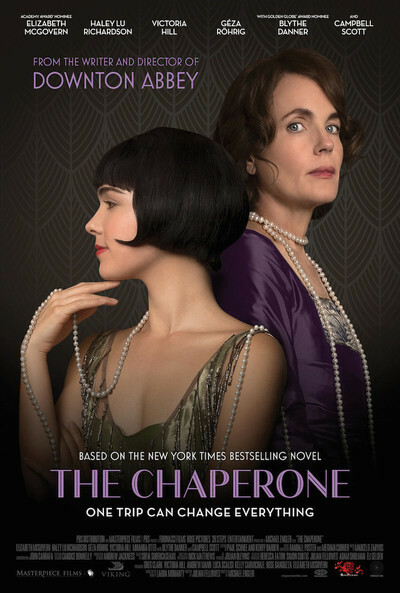 “The Chaperone” may be receiving a limited theatrical release, yet it is no more cinematic than any given episode of “Downton Abbey,” the series that Engler and Fellowes will be bringing to the big screen later this year. It has all the trappings of a Masterpiece Theatre production—picturesque scenery, impeccable costumes, gleaming period-accurate decor—yet there are certain areas of craftsmanship where the picture is noticeably lacking, even when viewed on a laptop. Most glaring is the poor ADR work for Hungarian actor Géza Röhrig, whose warm smile as Carlisle’s love interest is refreshing to see after his shattering debut in László Nemes’ great “Son of Saul.” Yet whenever his character speaks, the ambience suddenly cuts out, causing the dubbed words to be no less convincing than those uttered by Tommy Wiseau in “The Room.” It’s a technical misstep too distracting to overlook, especially since it clashes with the subtlety of Röhrig’s performance. What makes Engler’s film worth a look, apart from its two leading ladies, is how it manages to make a tale set nearly a century ago feel oddly timely. Brooks was sexually abused by a neighbor when she was only a child, yet she refused to be labeled a victim. With her innocence forever robbed prior to her tenth birthday, she later reclaimed her sexuality, inspiring countless women like Carlisle to seek the sort of personal fulfillment that Close championed so eloquently in her Golden Globes speech. By the film’s finale, Carlisle has created an unconventional existence where she and her family can thrive, at least when shielded from the judgment of others. She ends up giving Brooks the exact advice that McGovern’s weary author in “The Wife” urgently needed to hear, though in a way, both films explore the benefits of living a lie. Yet rather than brood in quiet desperation, Carlisle has prioritized true happiness, however private it may be.